Part of IMPACT Exhibition Management Co., Ltd, IMPACT Exhibition Organizers are the leading organizer in Thailand who organize and manage professional trade and public exhibitions, conferences, meetings and training courses, working hand in hand with international trade associations, organizers, and corporations across a broad spectrum of industries for more than 17 years.We offer you our specialist team with experience to ensure outstanding success of your events. Our professional team is ready to provide you with an all-in-one service from the integrated sales team, marketing team, operation team and designer team to support customer’s enquiries. We bring our experience, professionalism, flair and commitments to help develop and take your events to the next level of success. We also provide partnership options for both international and local organizers seeking to launch and grow international exhibitions and events in Thailand. 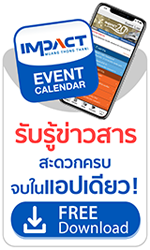 “It has been a great experience to work jointly with IMPACT to organize LED Expo Thailand. A team of thorough professionals & excellent team spirit with good facilities & good track record”. “Cooperating with IMPACT during AVL Thailand proved to be very memorable. We are happy to be able to work with a team of professionals”. “We have established in-depth cooperation and trust with IMPACT based on its professional teamwork and valuable advisory support rendered. As foreign exhibition organizer, IMPACT has provided to our exhibitors the valued buyers resources to enable them to successfully penetrate into Thailand and Southeast Asian market. We are absolutely pleased to have found such great strategic partner and are confident that our partnership will advance even further”. “Working with IMPACT, we are most impressed with their commendable cooperation in all aspects of our event. We are very happy to have IMPACT as our valued partner”. “IIR Middle East is part of the Informa Group and the market leader in business facilitating platform and we are pleased to work with IMPACT as our partner to launch two international exhibitions in Thailand and we are looking forward to increase our corporation with IMPACT”.